شهسوارگر, مولود. (1390). تداوم منظر فرهنگی؛ احیا و بازآفرینی یک باغ تاریخی. مجله علمی-ترویجی منظر, 3(17), 54-59. مولود شهسوارگر. "تداوم منظر فرهنگی؛ احیا و بازآفرینی یک باغ تاریخی". مجله علمی-ترویجی منظر, 3, 17, 1390, 54-59. شهسوارگر, مولود. (1390). 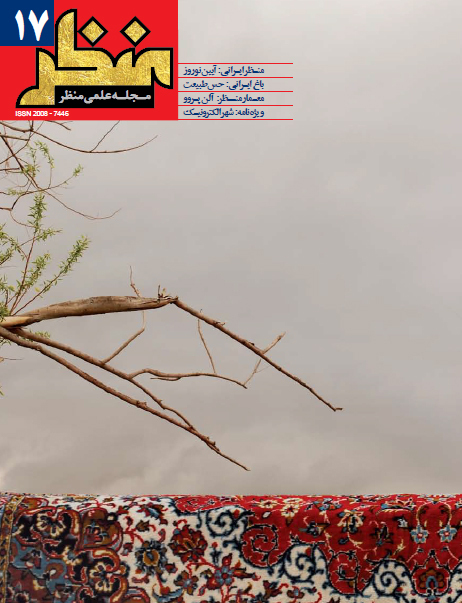 'تداوم منظر فرهنگی؛ احیا و بازآفرینی یک باغ تاریخی', مجله علمی-ترویجی منظر, 3(17), pp. 54-59. شهسوارگر, مولود. تداوم منظر فرهنگی؛ احیا و بازآفرینی یک باغ تاریخی. مجله علمی-ترویجی منظر, 1390; 3(17): 54-59. در فرانسه با پیشینۀ غنی باغسازی، باغ‌های تاریخی به عنوان عظیم‌ترین میراث فرهنگی بشر، بخش قابل توجه و مهمی را در میان سایت‌های تاریخی این کشور به خود اختصاص داده است. در 100 سال اخیر نظریات و رویکرد‌های متنوعی در برخورد با سایت‌های تاریخی مطرح شده و به لحاظ رویکردی و تکنیکی در احیای سایت‌های تاریخی تضارب و تشابه فراوانی از احیای حداقلی تا بازسازی حداکثری مورد توجه مسئولان و طراحان بوده است. در این میان در دهه‌های اخیر بحث مناظر فرهنگی و حفاظت از باغ‌های تاریخی بخش عمده‌ای از مباحث حفاظتی و احیای سایت‌ها و میراث‌های فرهنگی_ تاریخی را به خود اختصاص داده است. ایکوموس (ICOMOS)، کمیتۀ بین‌المللی ابنیه و سایت‌های تاریخی، 3 کنفرانس مهم منشور ونیز (1966)، منشور بورا (1981) و منشور فلورانس (1982) را در خصوص احیای محوطه‌های تاریخی برگزار کرد. در منشور فلورانس بحث احیای باغ‌های تاریخی مورد تأکید و توجه قرار گرفته است. این منشور، باغ‌های تاریخی را به عنوان یادبودهای تاریخی معرفی می‌کند و تمام ویژگی‌های طبیعی و فرهنگی را مورد توجه قرار می‌دهد. باغ‌های تاریخی بخشی از منظر فرهنگی هستند که در نتیجۀ همپوشانی و تعامل میان فرهنگ و طبیعت پدید می‌آیند، بنابراین در احیای آنها، تنها نگهداری و حفاظت از کالبد باغ به معنای تداوم ارزش‌های ناملموس منظر نیست و سبب از بین رفتن این ارزش‌های فرهنگی می‌شود. باغ‌ها به عنوان شاخص‌ترین مصداق منظر که در زمینه‌های مختلف فرهنگی و تاریخی نمودهای متفاوتی یافته‌اند، در هر زمینه مخاطب خاص خود را دارند و علاوه بر لایه‌های طبیعی و زیست‌محیطی دارای لایه‌های ارزشمند تاریخی و فرهنگی هستند، بنابراین نمی‌توان به احیای آنها در چهارچوبی محدود و با تبصره‌های مشخص پرداخت. این امر نیازمند رویکردی انعطاف‌پذیر است که معمار منظر با مطالعۀ منظر فرهنگی و تاریخی سایت و شناخت جنبه‌های مختلف شکل دهنده به منظر باغ در ابعاد مختلف، در کنار توجه به اصول و قواعد احیا و حفاظت به مرمت باغ بپردازد. این نوشتار تلاش می‌کند از ورای تحلیل و معرفی پارک ویلارسو (villarceaux)، رویکرد منظرین آلن پروو در برخورد با باغ تاریخی و احیای آن را مورد توجه قرار دهد. Benefiting from a rich background of gardening, French sites have been allocated to considerable historic gardens known as the greatest human cultural heritage. There have been diverse approaches and theories about encountering these historical sites in the past 100 years. As a result multiple similar and contrary theories including the least reclamation to the most reconstruction have been discussed technically. Among the mentioned theories, cultural landscape and preservation of historical garden have been the most negotiated preservation and socio-cultural heritage and site restoration theories in the past decades. ICOMOS, the international council on monuments and sites, had held three congresses of Venice Charter (1966), Burra Charter (1981) and Florence Charter (1982) about the conversation of monuments and sites. The Florence Charter focuses mainly on the historic gardens and considers them as historic memoires and gives great importance to its natural and cultural characteristics. Historic gardens are a part of cultural landscape which are resulted out of the mutual relations and interactions between culture and nature. Taking the landscape semantic aspects into consideration is more important than the physical features in restoration of such gardens. Therefore, maintaining and preserving the physics of a garden are not effective in continuity of garden values and will lead to loss of these cultural values. Gardens, as a foremost example of landscape which have been showcased in diverse historic and cultural aspects, have natural and ecological layers as well as valuable historic and cultural layers; As a result, their reclamation cannot be fulfilled in a confined and limited framework. It requires a flexible approach to provide the landscape designer with recognition of the cultural and historic landscape of the site in order to restore the garden based on the reclamation and preservation principles. Preservation and continuity of natural and historic values that reveal the culture and beliefs of the people in a region and demonstrate the interaction between human and nature throughout history are the main objectives in reclamation of a cultural landscape. The revival and reclamation of a cultural landscape and bringing it back to life and existence will eventually lead to environmental and natural reclamation as well as continuity of human and the surrounding nature interaction. Alain Provost’s approach in the cultural landscape project of Villarceaux Park was taking into consideration the historic background and the specific qualities and characteristics of French gardens and embodying them in minimal and abstract shapes. In this project preservation of historic elements of the site has been the main interests of the landscape architect that have been formed over time and adapted to the modern life. Holding public and cultural events such as concerts in the park has been very effective to its reclamation and its presence in the daily lives of citizens. This paper tries to discuss Alain Provost’s approaches to historic gardens and their reclamation through introducing and analyzing the Villarceaux Park.